Growing up in Washington state, Brandy Johnson found an early passion for soccer. Her determination and love for the sport took her to Northern Arizona University in Flagstaff, where she accepted an athletic scholarship to play on a division 1 soccer team. She soon became a team captain, and loved encouraging and pushing her teammates to do their best and not be timid on the field and off. After college, she moved to Telluride where she fell love with the San Juan Mountains. When she’s not biking or snowboarding, you can find her hiking with her dogs, SUP'ing the San Miguel River, or playing in town park on either the soccer or hockey co-ed teams. One rainy summer day, her guy friends took her on a mountain bike ride off of the gondola. They said it would be a lot of fun and that she’d love it. Little did she know that they were about to take her on a very tough trail, complete with rain to make it all the easier. The trail was filled with jagged rocks and steep, hairpin switchbacks. She returned home that night soaking wet, covered with mud and bleeding from more than a few places, but a new passion was formed. In 2014, her boyfriend (now fiancé :) talked her into racing the Big Mountain Enduro Series with him that summer. She was tentative to say the least, a competitor in every way she struggled to add racing to the mix as she wanted biking to be for fun and not something that became work. After several talks, they decided to focus on racing as a way to meet people that share their same passion for mountain bikes! She quickly found that her favorite part of racing was the time between stages, when all the girls would get to hang out while they waited for their turn to race down the hill. She loved how everyone cheered for each other, even though they were competitors. To her surprise, she won the last race of the season on some of her “local” trails on Moab’s Burro Pass and Hazard County, finishing 5th overall in the Amateur girls BME in her first season racing. The next season she raced two stops of the Scott Enduro Cup: Sun Valley and Park City - finishing 2nd overall in a 3 race series. Again, she loved the memories and new friends she made along the way more than the racing itself. 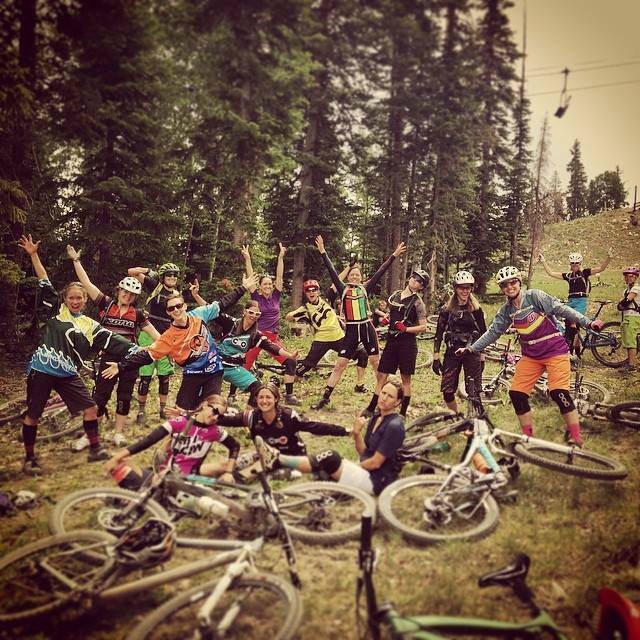 The next summer, a few of those new friends mentioned doing some Beti All-Ride Clinics together. It was there that she realized Mountain Biking, to her, is all about relationships and sharing her passion with others. This year she’s looking to get her Level 1 IMBA coaching license and is excited to be part of the VIDA ambassador program. She’s planning on conducting weekly women’s rides in Telluride and hoping to get more women into the sport, helping to empower them to push their limits, knowing that they’ve got women supporting them the whole way!